The plateau of Col de Vence is a relatively barren spot in France on the hills of Nice, above a 1000 meter slope. It is known for hosting a great number of mysterious phenomena that have been attracting UFO amateurs for long. This area is part of the very few places in the world where, in a relatively short distance, a great variety of phenomena occur: they are unexplained by science, they may seem at first sight independent from one another, being of a different kind. Yet, we have come to think, because of this one place and because of the synchronicity at times of several of such phenomena just there, that they have a common origin. We'll mention briefly a few episodes among the most significant ones recorded in the book “Les mystères du Col de Vence” (in french), published under Pierre Beake's direction, and we'll clarify them in the light of what is known about Elementals, mentioned on the page UFOs. We'll then see that all such mysterious phenomena, however varied and unique they may be, can actually be regarded as various manifestations of beings of nature. 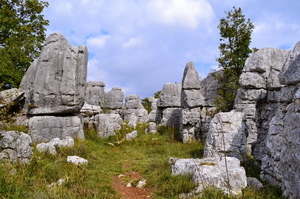 The mysterious rock falls are among the most spectacular phenomena seen in Col de Vence. While Pierre Beake and his friends were walking in the night along a quiet road, they saw themselves attacked with rocks falling all around them yet not hitting them. They were aware that the projectiles dropped vertically, yet couldn't see in the dark where they were coming from. The impact of the rocks over the pavement and the bodies of the cars was quite visible: several of them were greatly damaged and a few windscreens were even broken. They noticed that most of the rocks hardly rolled over the ground after impact. There were many sizes in the rocks, from the gravel to the pebble - some of them being as big as fists - their mass could, for some of them, be as heavy as several kilograms. Such events are the indication of an invisible intelligence, necessarily present in the spot, being in interrelation with the people who were there but were not aware of it. Such intelligences are capable of acting upon matter by throwing rocks with controlled force, so as to baffle harmlessly the ramblers (the fact that such rocks drop to their feet without ever rolling after impact shows clearly that such movements are kept under control and are not to be harmful). If we believe that such an incredible event ever happened, we must admit that it must have been initiated by an invisible intelligent entity that was among the protagonists. The stone parabolic path –indicating that an object is subject to an initial force before being subject to the law of gravity- shows that such an entity had calculated the precise strength necessary to throw it above the heads of the two people. What had been observed was the perfect synchronicity between the time when Patrick turned round and the time when the stone had been snatched off the ground. Such synchronicity is no coincidence. It is the indication that Patrick had been delivered the thought inducing him to turn round, that he had been mentally influenced by the invisible entity triggering the event, so as to be able to follow in full the movement of the stone. Such an event teaches us a lot, it highlights the particular relationship - a mutual respectful and benevolent relationship - between the invisible entity and the people there, and also indicates the pedagogical aim of the entity generating that experience meant to enable men to understand the processes at work. So, an intelligent and invisible entity – living in a different dimension – disclosed its presence on the spot, by communicating telepathically with one of the ramblers and by using a material object to attract their attention and baffle them yet with no harm at all: the same properties are found with the beings of nature that have been portrayed above, using some knowledge from spiritual science, on the UFOs page. As in the previous report, this event which could be described as out-of-the-ordinary, occurring right in front of witnesses, can be seen as one initiated on by some intelligence present on that very spot. An intelligent and invisible entity had decided to display to the four friends what it was capable of doing. There too, the synchronicity between the arrival of the four people in the car, the headlights activation and the manifestation of the rock, showed clearly that the aim of the entity was to challenge the witnesses, implying as well that it was perfectly capable of seeing them, even though it couldn't be seen by them. To relate this to the classification of materiality levels proposed on the UFOs page, we can point out that the density of the object manifested was then at its maximum level ((Mat 6)), the level corresponding to the type of dense matter found in our environment. The report mentioned that the rock “unfolded”: so, what looked like gravel at first became gradually as big as a pebble and then finally as big as a rock. What the four friends had witnessed was matter being gradually created from nothing, a process that perfectly outlined the abilities of its authors. Such an out-of-the-ordinary event, occurring just in front of witnesses, had once more an educational and quite valuable quality. Such a demonstration was made in the best possible conditions for each person to be able to observe it. We can see thus the clear determination of the entity concerned to bring help to some people who were trying hard to understand the phenomena that dazzled them. The typical aspects and the capacities at work there were those acknowledged in Elementals. Besides and according to spiritual science, such entities are the only entities present on the earth whose manifestation can consist in operating upon dense matter from the invisible levels. In addition, this phenomenon of stone hurling has often been mentioned in literature and, in other words, such phenomenon is generated on earth. Therefore, everything leads us to understand that the “rock falls” phenomenon is an inter dimensional manifestation (a MIDIM) generated by Elementals and meant for men.